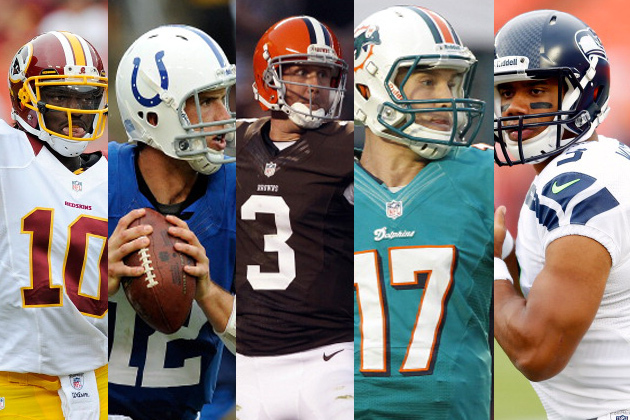 Future Bettors Are Grading The 2012 Rookie Quarterback Class! Robert Griffin III: The Redskins drafted RG3 with the full intention of making him the opening day starter which they did, and so far he has not disappointed! Under Griffin the Redskins currently sit atop the NFC east at 8-6 and have won 5 games in a row! RG3 has thrown for 2902 yards and has thrown for 18 touchdowns, with and only 4 inceptions, he 6 additional rushing touchdowns, 6 rushes for over 20 yards, the longest being 76 yards, and had rushed for a total of 748 yards on 112 attempts! Russell Wilson: The Seahawks picked up Matt Flynn from the Green Bay Packers to be their starting quarterback but Russell Wilson had other plans! Wilson has to be one of the NFLs biggest surprises! The Seahawks are currently 9-5 and are in 2nd place within the NFC West. If the playoffs started today the Seahawks would be the # 5 seed and they would face the Washington Redskins in the 1st round of the NFC playoffs. Wilson has passed for 2697 total yards and has thrown for 21 touchdowns with 9 interceptions! Ryan Tannehill: The Miami Dolphins think that they have found their man in Ryan Tannehill now all they have to do is work on getting him a supporting cast! The Dolphins are currently 6-8 and are hoping to win out to get to 500 and build momentum for next season. Tannehill has passed for over 2900 yards with 10 touchdowns and 12 interceptions it has been a tough season for him but one he can build on! Andrew Luck: The Colts selected Andrew Luck as the overall 1st round draft pick in last year after going a dismal 2-14 in 2011. Luck has surpassed all expectations as the Colts currently sit at 2nd place in the AFC South at 9-5! The Colts are currently the #5 seed in the AFC playoff race if the playoffs started today! Heading into week 16 Luck has thrown for 3987 yards and has 20 touchdowns & 18 interceptions and 5 rushing touchdowns.